The game Round the World with Nellie Bly was first published in 1890. 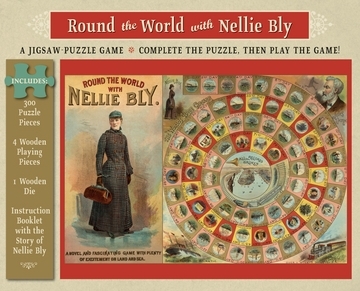 The original artwork for the game—held in the Liman Collection of American Board and Table Games at the New-York Historical Society—is reproduced on this 300-piece jigsaw puzzle. Also included in the box are four wooden playing pieces, one wooden die, and a booklet containing play instructions and more information about the game’s heroine.